You can now own a Faansie Peacock artwork! We’ve produced limited edition prints of some of the stunning plates from Chamberlain’s LBJs, on high-quality, A3 art paper. 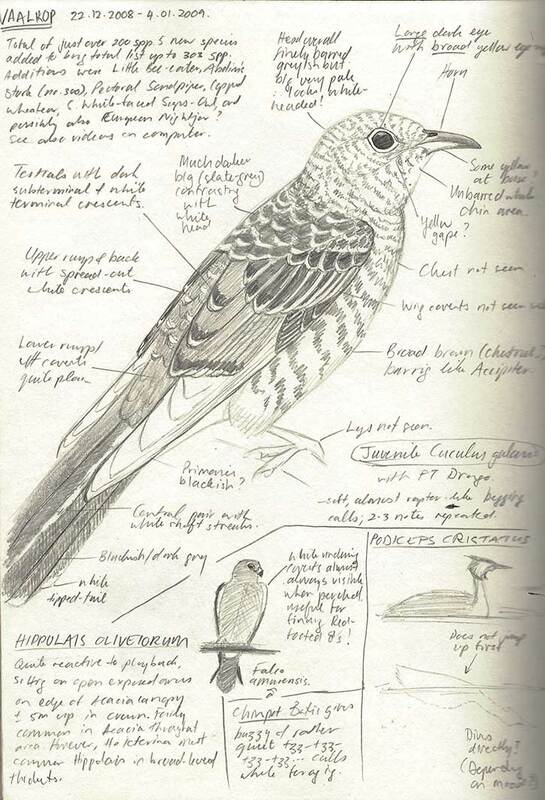 Each print is numbered (out of 25) and signed by the author, with the bird’s name handwritten in pencil on the plate. 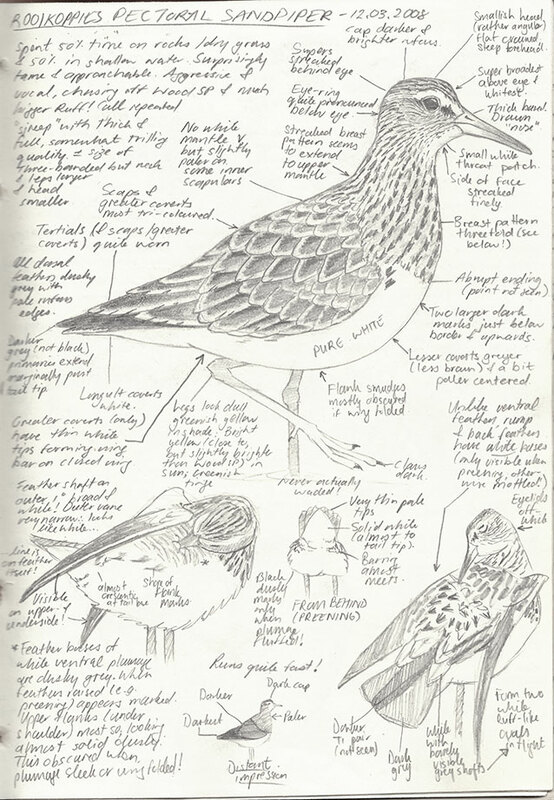 Depending on how sales of the LBJs plates go, we might produce some prints from Chamberlain’s Waders in future – such as the Hottentot Buttonquail shown here. Plates sell for R850 to R1100, including postage (by Aramex Couriers, PostNet or SA Post Office) anywhere in South Africa. If you’re in another country, let me know and I’ll send you a quote. Please get in touch if you are interested in buying one of these plates. Some are designed to be sold in sets (optional) such as the 5x apalises, or the 6 long-billed larks. Click here for previews, with background information. 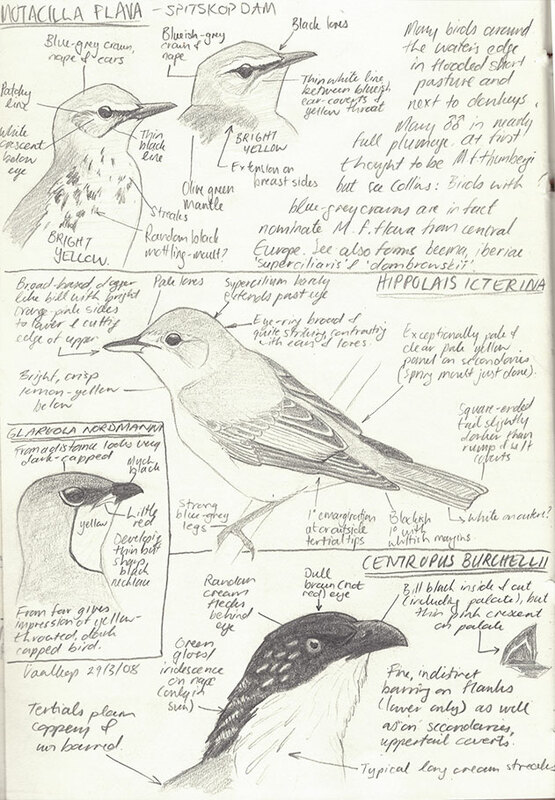 I have been sketching and painting birds for as long as I’ve been birding. 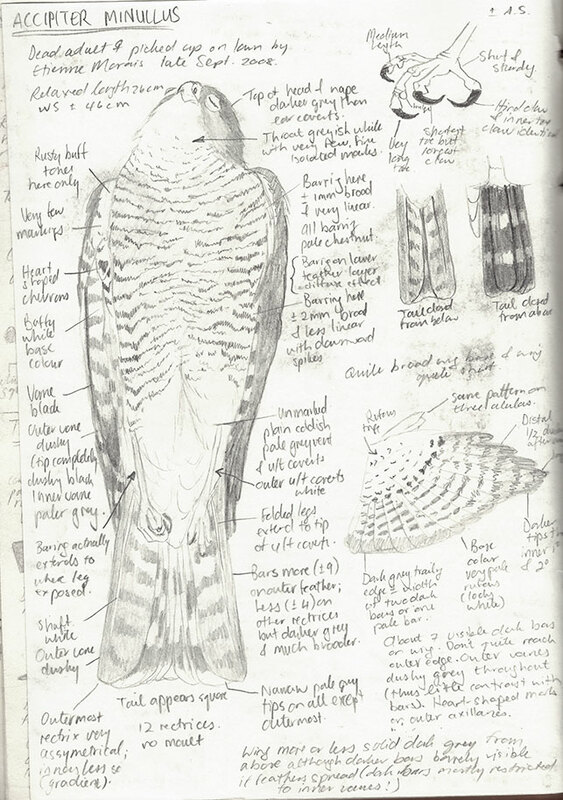 Initially, it was simply in an attempt to capture and solidify my experiences of birds. A celebration of that bird, in that place, at that moment – and the few seconds of its life that it shared with me. 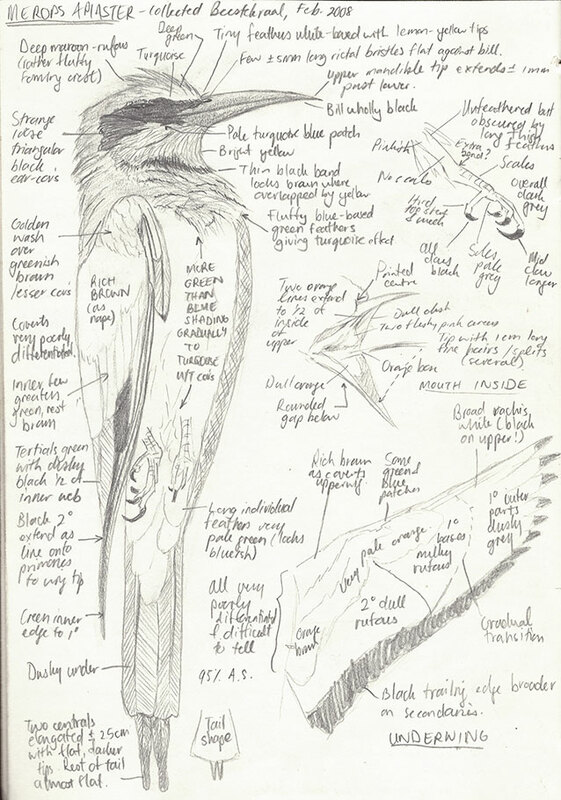 As my interest in birds became more developed and honed, I started to notice more and more variations, which brought me to the realisation that each bird is an individual, with its appearance governed by a whole range of temporal and spatial influences. 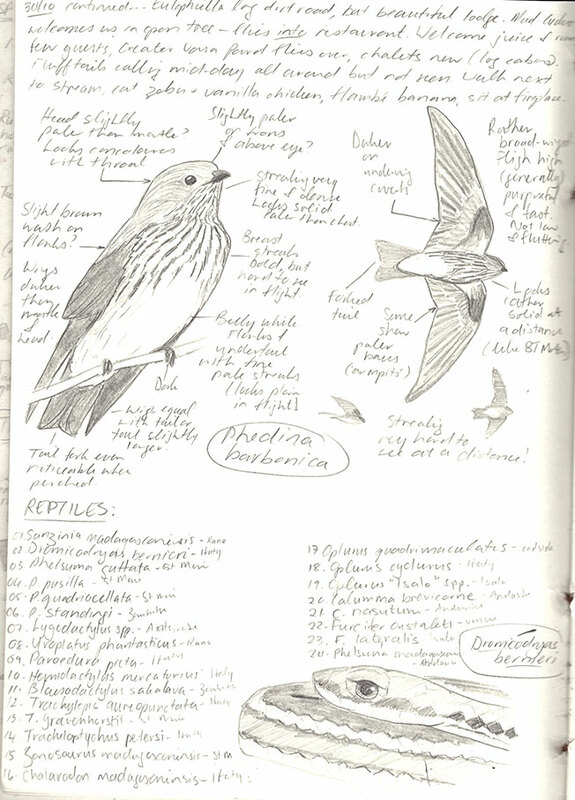 I started documenting these sometimes subtle, sometimes remarkable deviations from the field guides, and filled up notebook after notebook with annotated sketches. Especially for birds we see every day (perhaps a little less so for the occasional once-in-a-lifetime rarity) our brains automatically only store the smallest possible amount of visual information necessary to fit an observation to a search image. 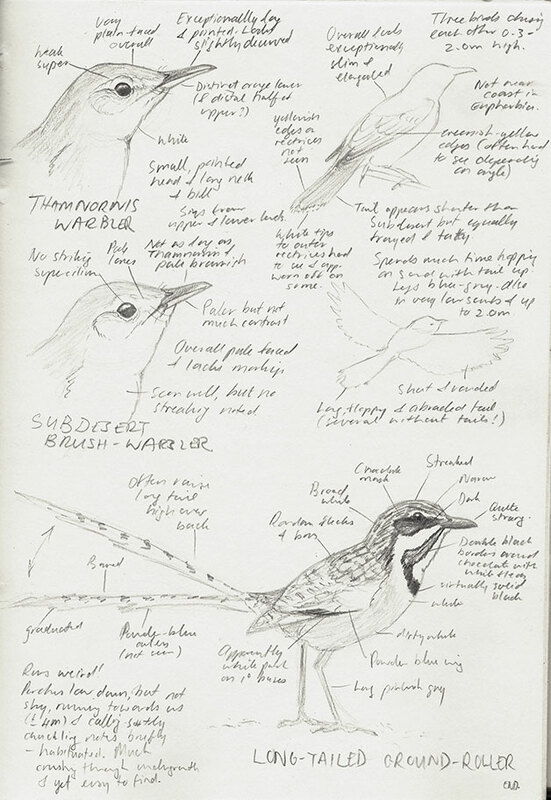 Sketching birds overrides this instinct, by forcing you to look closer, and remembering more. I really believe this is the most effective way of improving your birding prowess, and I highly recommend it. Remember, the product is not important. What counts is the process. My earlier artworks were exclusively pencil or pen sketches. In my late teens and early twenties, I worked with watercolours and gouache, but always felt rather restricted and frustrated by the practicalities of these mediums: waiting for paint to dry, washing brushes, mixing the perfect tones, curling of wet paper, storage and care of physical paintings, coffee spills, and so on. When I started illustrating my LBJs book in my late twenties, I discovered digital painting and a whole new world opened up for me. I remember chatting to a sweet old lady one night, at dinner after a long day in the field. I explained the whole process of digital painting to her, trying to avoid jargon such as tablet, stylus, CMYK, colour profiles, and the like. Upon conclusion of my monologue, she remarked “Oh, so it doesn’t require any artistic talent then?” I had to stifle a laugh, because just like in any other medium, producing a digital painting requires a great deal of artistry, and more importantly, practice. I typically start by collecting as much reference material as possible. The most valuable source is my own notes and sketches amassed through the years. I also trawl the internet for photographs and open every book that I have on that species to the correct page. If there is any space left on my physical and digital desktops, I may also loan study skin specimens from the museum, or consult reference photographs of such specimens. Next is the tedious but critical process of the outlines, and I typically spend about a third of the time it takes me to finish an illustration (roughly 3-5 hours) on this laborious process. Often I find the most challenging aspect to be the shape of the forehead and crown, for some inexplicable reason. 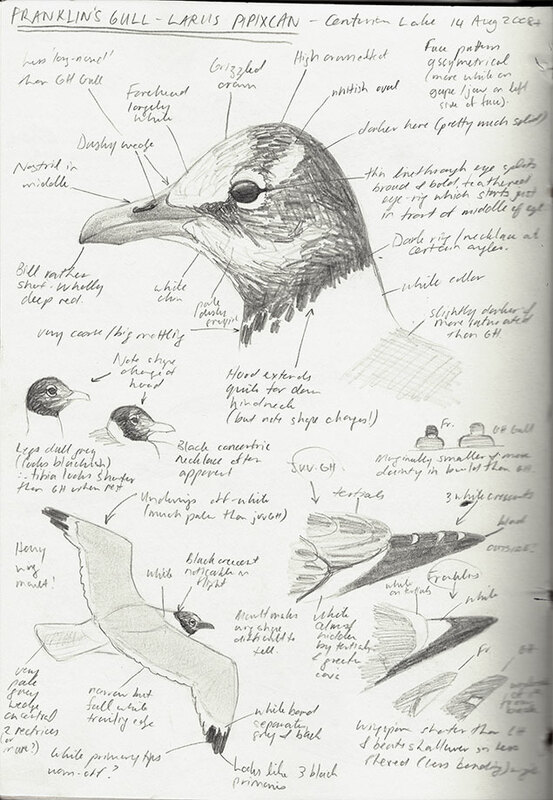 Knowing your subject is vital at this stage, and it is here where an experienced eye can immediately distinguish a picture painted by a birder, from that painted by a general wildlife artist. How many secondaries are there? Are the primaries emarginated? Which way do the median coverts overlap? How many rows of scapulars are there? Does the species have rictal bristles? Such technical queries cannot always be answered by studying even the best photographs – in cases where I’ve really ground to a halt, I’ve even gone as far as visiting the local zoo or pet store to see this species or a close relative, in order to study the feather arrangements in detail on a live bird. Once the outlines are in place, colouring is relatively straightforward. I start with solid darker layers to represent the deeper feather layers, and then build up a few layers of lighter feather textures on top. I usually start with the bill and eyes, then do the body, and finish with the wings, tail and legs. Shading and touch-up layers complete the process. 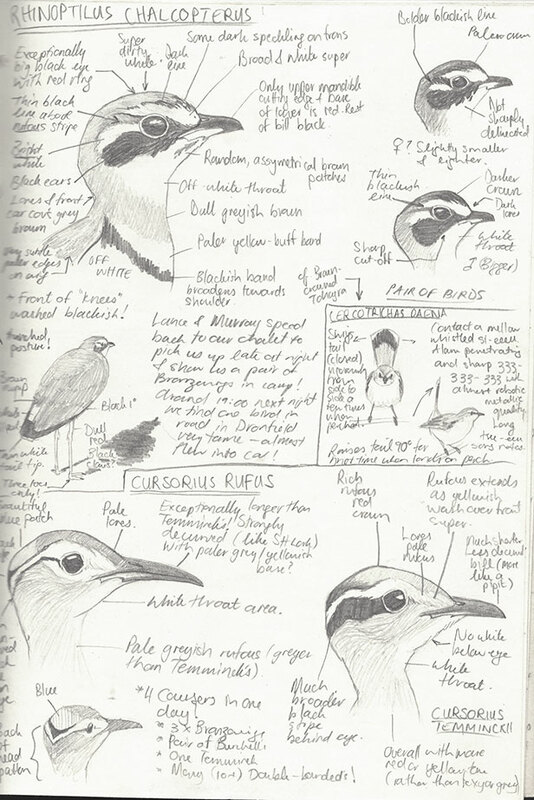 Illustrating birds for field guide purposes does not necessarily give the artist much liberty for creative freedom, and therefore I particularly enjoy painting the small behavioural or habitat images in the background. The main challenge here is keeping the scale in mind, and not wasting hours on superfluous detail. 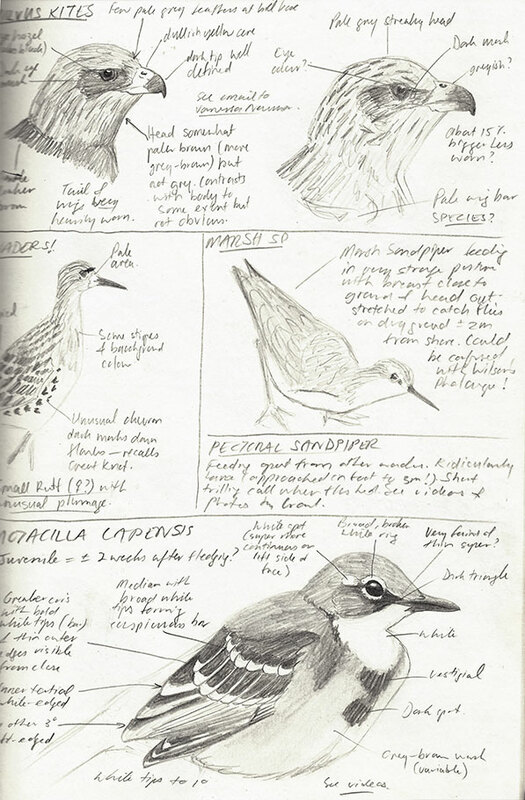 But in painting these representations, I once again get a chance to reflect on my personal impressions of the bird, and relive fond birding memories – forgetting scientific technicalities for the moment. Here I demonstrate the different layers involved in a digital painting of an African Snipe. This image is on page 179 of my Chamberlain's Waders book. I use a Wacom Intuos 4 Tablet (hardware) and Corel Painter 11 (software). This process normally takes me about 3-5 hours. Enjoy! 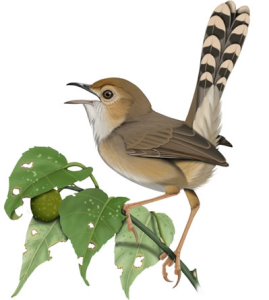 This is a sped-up video of me painting a Terrestrial Brownbul using a Wacom Intuos 4 Tablet (hardware) and Corel Painter 11 (software). This process normally takes me about 3-5 hours, but is here shortened to about 8 minutes. This image is on p. 342 of my Chamberlain's LBJs book. Below you’ll see some scanned pages from my various notebooks and journals. There is a lot of useful information encoded in here. Enjoy!